September 01, 2012: It was one very busy day in office. I just managed to leave office at 1710hrs, and took the NICE road to reach home by around 1830hrs. After a round of browsing on the internet, I got fresh, had dinner and quickly got ready. My brother was to drop me at Madiwala – we started at 2015hrs. Had to stop on the way for some purchase – thankfully, there was no traffic snarls en route, and we made it to Madiwala at 2045hrs. My brother moved after dropping me. I headed to Friends Travels’ office there. The guys in the office were dead busy – they were arranging something to send two North Kerala bound buses. They politely asked me to have my dinner and come back by 2115hrs. I headed out of meet my acquaintances around. The entire area was stinking like a garbage dump – the recent garbage block faced by BBMP ended up creating a huge heap of garbage on the other side of the road. A land mover was being used to load that garbage on to a truck – and this resulted in the rotten garbage being tossed around. The stink was unbearable. I returned to Friends Travels’ office at 2115hrs – My boarding pass was issued and they collected the ticket fare (Rs. 950). 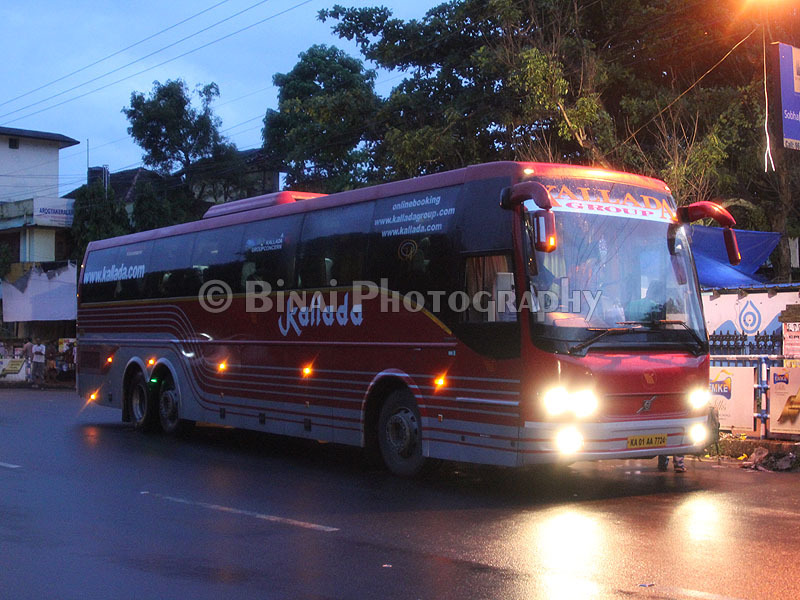 A lot of passengers were waiting to board my bus – the B9R to Changanassery. I was chatting with a guy from G4, and was astonished to see the number of bookings they get to Thrissur. 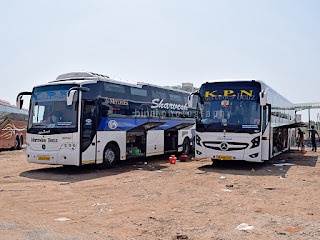 The number is enough to have a dedicated bus to Thrissur – that would take off considerable load from their other buses and even help in the other buses reach their destination earlier. Passengers were flowing in steadily, and all of them were for the G4 B9R. The bus came in at 2131hrs – just a minute late from the time mentioned by the guys at Friends! The bus was KA-01-AA-7734 – the red coloured B9R from their first lot. Boarding started immediately – the cleaner was helping passengers with their luggage. I stood near the bus till most passengers got in – Passengers behaved typically Indian – pushing and shoving around to get in first. The first thing I did on getting on board was to read the odometer – it read 2.54 lakh kms! The interiors were clean and fresh – well kept as well. I moved to me seat (#9). My co-passenger was already there. He had two heavy bags, which wasn’t getting on to the overhead rack. So he kept it on the floor – I requested him to leave it in the boot, since luggage strewn on the floor could become missiles later. Later, the G4 crew came and requested him to leave the baggage in the boot – they carried it themselves. A quick headcount was performed, and the bus was ready to move. AC was set to very comfortable temperature. The bus got moving bang on time, at 2145hrs. Just as the bus moved half out, the dispatcher realised that one passenger was missing. The bus stopped, and the guy got calling the missing passenger. After waiting till 2151, they decided to start the bus. We took a U turn at St. Johns Signal, came back and stopped right opposite the Friends’ office. We waited for another 2-3 minutes, and then started moving. The bus stopped again, this time near Madiwala Police Station at 2159hrs. In the mean time, they started playing a movie in the bus. Umpteen buses overtook us, while we waited for the passenger. The wait continued till 2215hrs. We started off – the passenger still hadn’t boarded. The bus picked pace quickly and we got on the Elevated highway, and rushed towards Electronic City. The bus stopped again after crossing the toll gate (at the end of Elevated highway). One passenger got in – I guess this is the same passenger who was missing at Madiwala. We started off at 2227hrs. Lights were switched off now. It was a recent movie, being played in the bus. My recent journeys by bus allowed me see a lot of unseen movies! There was heavy traffic until we crossed Hosur. The driver was well behaved on the road – no rash cuts or honking. He hardly used the horn at night. I was so engrossed in the movie that I did not notice the time or where we reached. We crossed Krishnagiri toll around 1145 or 0015hrs (something like that – I did not note the time). The movie got over – and like the last time, the crew did not bother switching off the ENT system. Guess what – the movie started playing again! The movie was switched off only after it played again for some 20 minutes or so. I was half asleep by the time they switched the movie off – again like the last time, this was when the bus stopped for a quick break! I slept really well after the bus got moving – I slept uninterrupted till we reached Walayar (0411hrs)! I got off the bus at Walayar, and made a short stroll. It was drizzling outside – and hence I could not stand outside for long. I got back into the bus. One passenger went outside (for a leak) just as the driver got in – the driver was disappointed by the delay the passenger was making and he used the horn a couple of times. We started moving at 0421hrs. 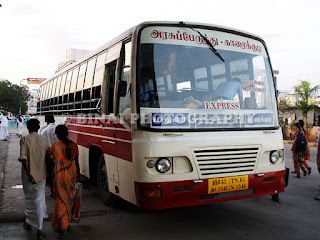 The road was bumpy after Walayar – the bus was dancing all the time. We stopped at Palakkad bypass to drop a few passengers (0442hrs). We dropped another passenger at Palakkad bus station. Our bus took the Ottapalam-Shoranur route towards Thrissur – this route is now used by almost every operator, in order to avoid the treacherous road between Mannuthy and Vadakkenchery – the potholes resemble lunar craters on this route! The ride was smooth on the Ottapalam route – I slept for most of the time. I woke up as the bus crossed Mulagunnathukavu. I pulled up my backrest, and sat upright for the rest of the run. I was admiring the way the drivers handled the bus – both the drivers were not rash. The bus finally pulled in to Thrissur round at 0559, and I was dropped outside the General Hospital at 0600hrs! The bus was about 30 minutes delayed compared to its schedule – but considering the longer route taken, and the wait for one passenger, I think the arrival time was great. 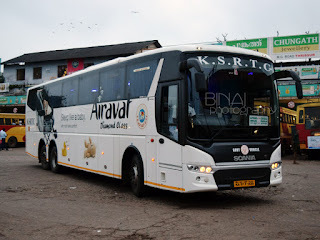 Other points: With over 2.5lakh kms on the odo, the bus did not appear even a bit tired – it was maintained really well. All the lights (on the body) were working. 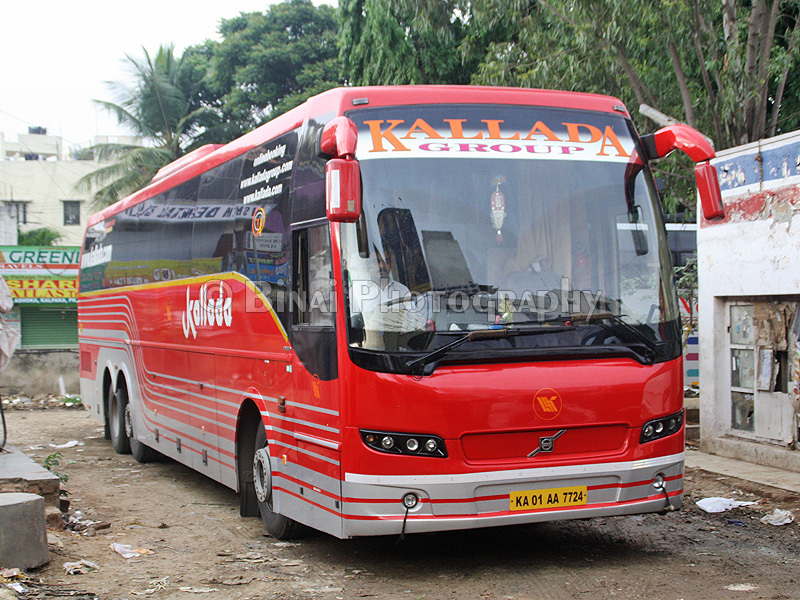 I am really impressed with Kallada G4s maintenance – both my recent journeys did not disappoint me. The crew disappointed me again this time – the delay in switching off the TV after the movie got over, and the unhealthy habit of switching on all the lights to aid one alighting passenger. This time too, the cleaner shouted from the cabin itself. The bus had all its seats taken – shows the preference this bus enjoys on the route. I had traveled in the very same bus on the very same day, on the same route last year. (Read the review here) The bus was still in the immaculate condition during journey, exactly as it was in 2011! Hats off for the good maintenance. A suggestion to Kallada G4: Please start a new bus to Thrissur (better to Kodungallur or Guruvayur). This will take off the load from the Changanassery bus, as well as your other buses. By adding a dedicated service, you can send all the other buses through the bypass and save some time. Also, advance the timings of the Changanassery bus to 2100hrs. Going by the timings on the day of my journey, the bus would not make it to Changanassery before 9AM. That would be too late for end-to-end passengers. Will I take this service again: Why not? Getting a ticket in G4 is a big task these days! You guys are doing a great job – just don’t dilute them! I have no complaints about this operator except some minor teething troubles here and there – it’s not an easy task to satisfy everyone. Nice review Binai! And your suggestion towards the end is very good. Buses with destinations beyond Kottayam should start a bit early so that passengers reach their destination at least by 8 AM.